This is the third time that the independent transport videos cameras have been invited to record the Warminster Vintage Bus Running Day. In 2012 the event took place on Sunday 7th October and was centred on the main town car park that was transformed yet again into the ‘Coach Station’. This excellent event sets out to re-create the 50’s, 60’s and 70’s era of bus operation in West Wiltshire. This programme will certainly bring back the memories for you featuring a selection of buses and coaches that would be seen operating in the area, as well as some visiting vehicles just for good measure. You will be seeing Bristol L and K types as well as an SU, MW and RE in both bus and coach form, not to mention VR’s and an FLF. A number of these Bristol types are from the ‘local’ Bristol Omnibus Co. to add a touch of realism. 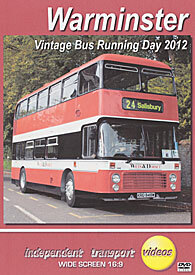 There are also three beautiful Bedford OBs as well as Leyland Nationals and a London Transport Routemaster! Some of the other fleets on the programme are Wilts & Dorset, Midland Red, Royal Blue, Devon General, Alder Valley and Trent, so the list goes on! We arrive at the Warminster Coach Station on board former Bristol Omnibus Bristol RELL6L / ECW B50F 1257 (DAE 511K). From its ‘depot’ we travel through the Dorset countryside and catch up with former Midland Red BMMO S23 type 5919 (RHA 919G) on its way to Shaftesbury to act as a feeder service to Warminster. On arrival at the Coach Station we see vehicles arriving to take up their duties for the day. Our cameras then take up positions along Station Road, Market Place and in the Coach Station to record the action. Later we take a ride on superbly turned out former Wilts & Dorset Bristol VRT/SL3/6LXB 3448 (KRU 848W) on a special ride for our cameras to the village of Heytesbury and then back to the Coach Station. Further filming takes place along Station Road, Market Place and the High Street. The final sequences of the day are filmed in the Coach Station as the final arrivals and departures take place. We would like to thank Bob Eade and “H&DW&D” for organising this excellent event.